Meet the crew of Arrowwood Service! Think of them as your “Acura and Honda repair professionals”! These three guys not only own the place, but they will be the ones personally working on your vehicle & are here to make sure that you and your family are driving a vehicle that is safe and reliable! 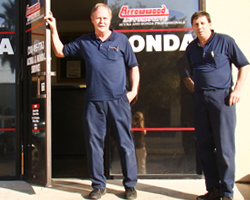 Greg Snyder, the President and Owner of Arrowwood Automotive Acura and Honda repair shop in San Antonio has been a Master Technician since 1987. His first interest in mechanics began as a means to an end when he was 14 years old. He took a summer job working in a mechanic’s shop to earn enough money to buy his first motorcycle. When asked why he became a mechanic himself he replied, “I must have been crazy.” But even now after so many years in the business, you can see his passion for the work that he does, providing outstanding customer service and quality work that he can be proud of Kelly Postert, the Vice President and Owner of Acura and Honda auto service shop in San Antonio has been a Master Technician since 1988. Born and raised in San Antonio, TX, he has built a reputation of honesty and reliability in his hometown. Instead of working in a large nameless and faceless service department, he works one-on-one with customers and their vehicles to provide service and advice that he can stand behind. 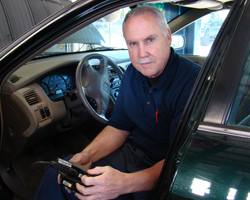 David Snyder, Treasurer and Owner of Acura and Honda auto mechanic shop in San Antonio has been a Factory Trained Technician since 1994. Always providing a high quality, true integrity, and respect for his customers, David has built a solid and valued reputation here in town. Friendly, laid-back, and knowledgeable, you will have a terrific experience working with these guys when getting your vehicle into tip-top working condition. Whether it’s just for some regular maintenance or if you need a major overhaul you can trust these three professionals to get it done right at an affordable price the first time!